New Delhi: A day after it compared Rafale deal to 'Bofors scam', National Herald has now published a survey that predicts a BJP victory in Madhya Pradesh elections. 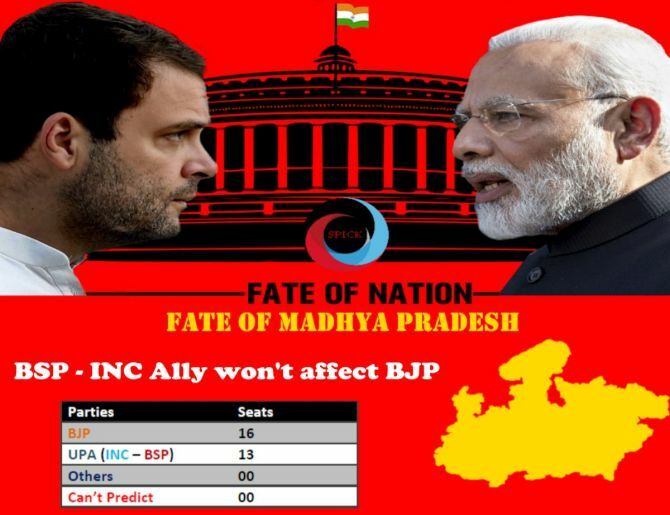 Citing a pre-poll survey by one Spick Media Network, National Herald reported that BJP will bag 147 seats in the 230 seater Madhya Pradesh assembly if Congress and BSP contest 'separately'. In a scenario, where Congress- BSP contest together against the BJP, the report predicted that the BJP will win 126 seats. According to the survey, if Rahul Gandhi's Congress and Mayawati's Bahujan Samaj Party forge a partnership ahead of the polls, the BJP will get 126 seats. The Congress-BSP combine, on the other hand, will bag 103 seats. On the other hand, if the Congress and BSP do not form an alliance, the BJP will easily sail through the elections and emerge as the single largest party, bagging 147 seats followed by Congress- 73. Interestingly, citing the survey, the report says that 'the popularity Prime Minister Narendra Modi remains very high in Madhya Pradesh'. It further says that in case of a situation where MP goes to Lok Sabha and Assembly polls together, the 'Congress-led alliance will have to work not just doubly, but triply hard to win the state back from BJP (sic)'. "Prime Minister Narendra Modi is seen as the most attractive leader by MP respondents, with 41% support. Rahul Gandhi (9.72%) is in second place as the most attractive leader, though far behind PM Modi," the Spick Media Network report cited.